I have been collecting and cutting up HDPE, and hoping to make some blanks for the lathe. I have a question about the labels that look like they are a decal or printed right on the bottles. Can the plastic with the decals be melted? I was going to experiment with it, but thought I could ask first and maybe be saved from some horrible mistake. I've been reading through the old posts about HDPE, and haven't seen that type of label mentioned, yet. Question 2: Does the smell from the detergent bottles ever go away!? I washed them, soaked them in vinegar solution, tried baking soda... they still smell very strong! We use all unscented products and I find the smell much too strong from this plastic. What good would a top be if it's turned out of plastic with an overpowering smell?! Hey!!! I am back on the forum and able to post again. Thanks, ta0!!! I think plastic with some of the labels can be melted but I usually cut around them and don't deal with them at all. When I first started in on HDPE I would scrape that printing off and then melt it in with the rest, but that became a pain and it was much easier to cut around it. Most smells fade away fairly quickly. I have always been humored by that soapy smell. Yours must be stronger than what I dealt with around here. Good luck with your melting! I think plastic with some of the labels can be melted but I usually cut around them and don't deal with them at all. I pretty much came to the conclusion that the labels weren't worth dealing with. 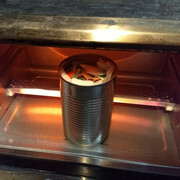 I bought a used toaster oven for $5, which is quite small so I had to place the can right on the floor of the little oven. It didn't seem to be melting as expected with it set on 350F, so I spent another $5 on an oven thermometer. After I got the temp up where it should be, I had better results. I had watched a video where they did a slow cool down by reducing the temperature every 10 minutes or so. Supposedly you don't need to clamp it under pressure with that method. So, that's what I tried. I had to speed that up a bit because of an appointment and couldn't leave with the little oven on. So, of course, there are quite a few air pockets. The all white one was only milk bottles, and I really rushed it, so it's pretty much a loss. I'll cut it up and remelt it. Not sure if I will try the slow cool down again, or go for a clamp. Wondering if it would help to put a lid over it to stop some of the browning. I have recently been working with HDPE again. It just seems to be endlessly fascinating to me. I made some flat fish to give away at a children's sermon. Now I am making a lot of flat hearts to give away to people in honor of Valentine's Day. I do a lot in a flat cake tray then shape the pieces when I can see they are totally melted. 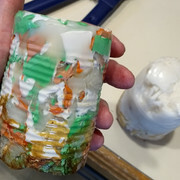 I have not had as much success with upright cans because some of the HDPE in the middle of the container does not get melted very well and I do not notice it until it is on the lathe. johnm once made a comment about melting HDPE too many times and how it does not seem to do as well after being remelted over and over. I finally better understand what he means. Some material that has been remelted too often has lost its nice color. It looks and acts more "muddy". It even stuck more to my gloves and I had all kinds of trouble getting it off. These are some of my most recent observations. I wonder if you could use a cookie cutter for the flat pieces. Might have to spray it with mold release. If you use the upright cans, you have to add very little at a time, which makes for a very long process. If you 1/2 - 1 inch at a time every 4 or 5 minutes, and tamp that down before adding more, I get pretty good results. But, you still end up with the vortex in the middle during cooling, unless you do a slow back down of the temperature over several hours. The time involved for that is hardly worth it, especially if you can only get two cans at a time in the little toaster oven I use. I'm thinking about buying a used apartment size oven to put in the garage. Wow! You are ready to go at it if you are thinking about an oven in the garage!!! I do have cookie cutters that I use from time to time. The results are varied. Mostly, I enjoy cutting the flat pieces to the shape I want while it is still warm. Of course, I can not do anything very intricate that way. By rolling the heated HDPE on itself and then reheating it and pushing it together, I have had fewer voids in the middle. Those voids in the middle sure can be frustrating when it gets time to lathe the point and there is not much to make a point with. I have yet to try the show back down of the temperature over several hours. Good luck with your melting. I have got to go take care of some HDPE in the oven right now!